Discover this wonderful selection of the best free calendar apps for iPhone and iPad. The best alternatives to the native Calendar application for iPhone. In GETIOSSTUFF we like to inform our readers about the best free iPhone apps in all fields, genres and categories. We try to select the top free apps that make life easier for users and who meet the necessary requirements to make your iPhone and iPad an even more productive tool. 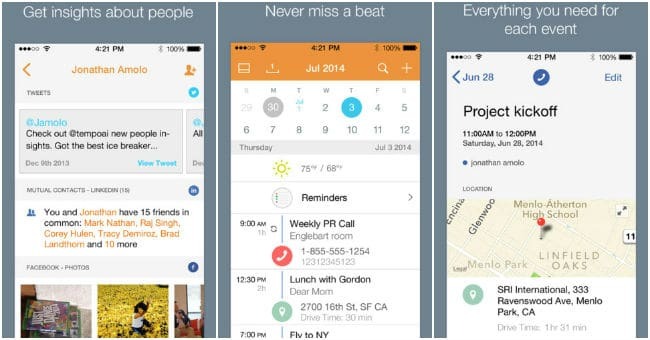 On this occasion we have prepared a selection of the best free calendar apps for iPhone. If you think that the native calendar application is not complete enough take a look at this little collection and select the app whose functions meet your basic needs. 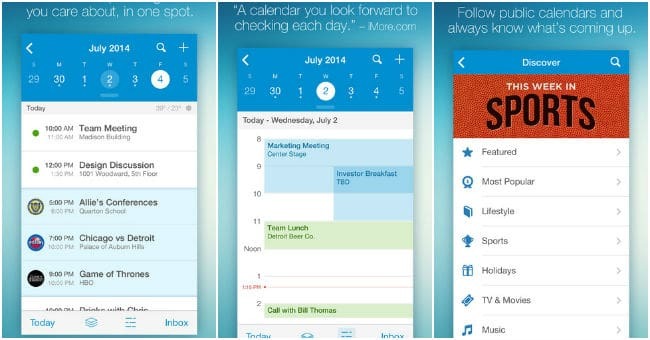 Here are some of the best iPhone calender apps. 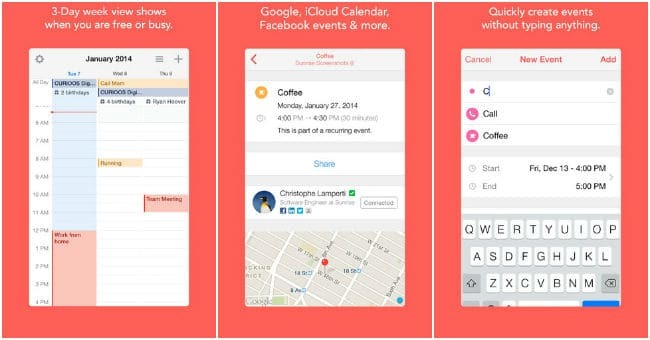 Cal is one of the best free calendar apps for iPhone. This application has a quick, intuitive and minimalist design interface. This app offers many useful functions for its users. It integrates seamlessly with all calendar services already have, so you’re always up to date; and contacts, places and social integration lets you send messages and plan festivities directly from the app. We want to put it on the list of the best free calendar apps for iPhone for its interesting and creative proposal. This is the first social calendar for iPhone that combines not only the professional life but also personal life primarily on platforms like Facebook, where events and birthdays are the main attractions. With an interface and powerful reminder system, Sunrise is an excellent choice for those who take Facebook as a guide of things to do. This free calendar application also support with Google Calendar, iCloud and Exchange too. This is another excellent example of how smart can be a calendar app. It starts as a full time planner, but goes much further. Like Sunrise, Tempo has clear visual characteristics that make reading what is on the agenda and the entry of new events are simple and almost pleasant. It also integrates with a wide range of existing calendar applications and services. Tempo has a number of additional features. You can sign up for a free conference call through a partnership with Speek. Also, you can send birthday greetings to pages on Facebook for your friends from the app. You can also find the latest flight you have planned and entered into the application and view maps and directions information. UpTo Calendar premieres new interface and functions being rethought to handle each of your calendars and even add other social calendars without further complications. 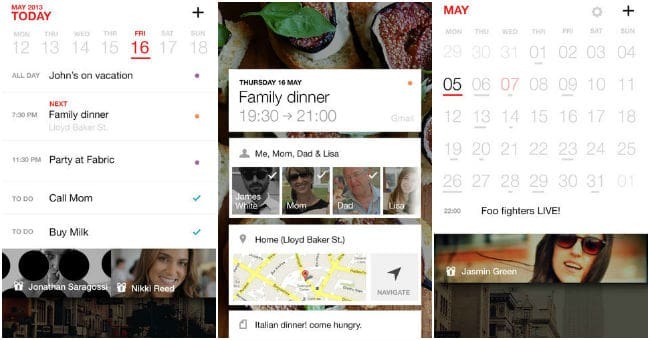 It simplifies your calendars dividing the interface on two screens or layers (front and back). Your primary calendar and the most important events will be in the front. And in the back other social calendars that are secondary in your day to day. Its interface is clean and has a modern look but more importantly, it is intuitive. This app works with iCloud, Outlook, Google Calendar, Facebook Events and any other calendar that syncs with your phone. With these best free calendar apps for iPhone and iPad you can keep track of your schedules, meetings and important events on iOS devices. What is your favorite calendar app for iPhone? If you use any other iPhone calendar app that worth to be included in this list then share the name in the comments. Thank you.